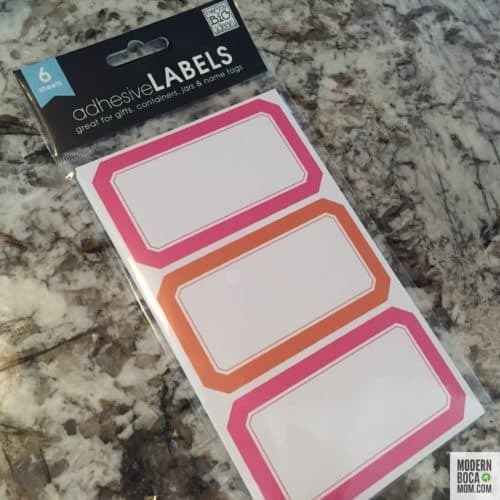 Back-to-school time this year was busy for soooo many reasons. #dailybocaavery started preschool at Grandview Preparatory School and our family spent much of the summer working and traveling, so I felt like we were still playing catch-up. I swear, I just needed one more week! 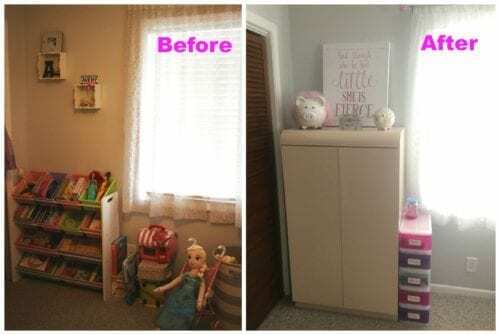 In the spirit of positive change and to celebrate our daughter’s entry into “big kid school”, we decided to transition her out of her toddler bed and give her nursery a big girl bedroom makeover! 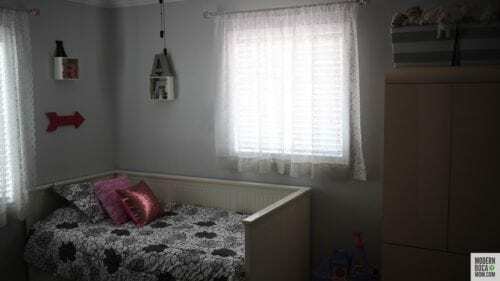 The first update: the bed. 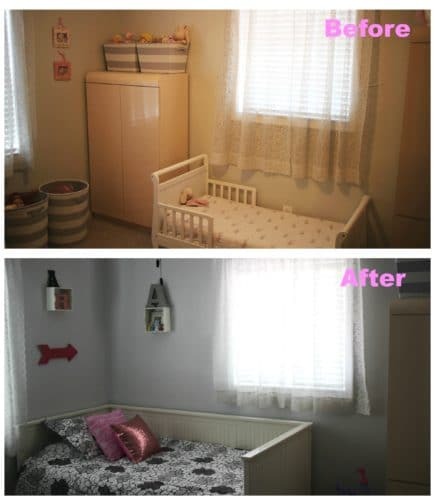 The one we chose for our big girl bedroom makeover is from IKEA. It’s so cool! You can keep it as a twin/daybed/sofa OR you can pull out the section with the storage drawers underneath and it opens up into a Queen bed (2 mattresses stack on top of each other, so you just slide one over). 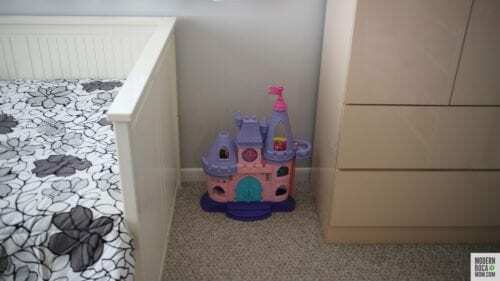 I can see it becoming a huge help when Avery starts having sleepovers or we need an additional guest bedroom. The big girl bedroom makeover bedding I chose is from JCPenney. 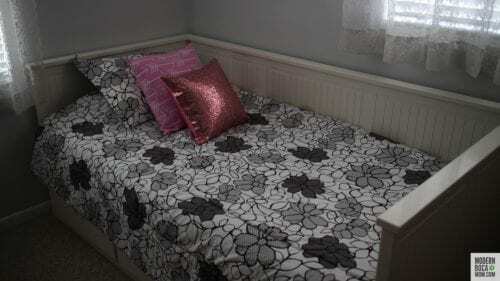 I had a heck of a time trying to find pink throw pillows to compliment the black, white and grey modern floral design. 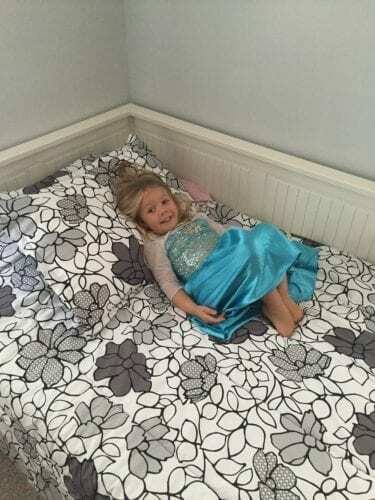 It was an adventure looking for different kinds of beds for the big girl bedroom, a friend of mine told me about a few places to get good mattresses, if you’re interested in you might want to learn about them at Leesa. I looked everywhere, but finally netted out at Amazon.com HERE and HERE. 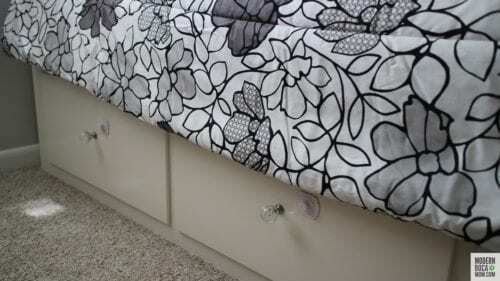 The pillow inserts were sold separately. 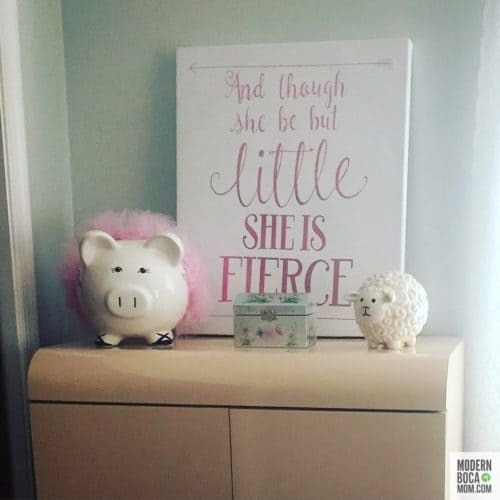 Big Girl Bedroom Makeover Decorations: Collaboration is key! 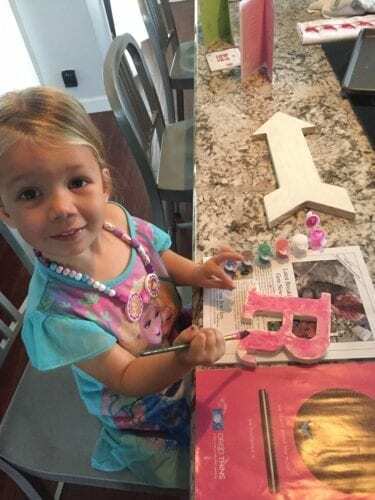 As for the decorations above the bed, I re-purposed two white shadow boxes that previously held “baby mementos” and had #dailybocaavery decorate unfinished wooden letters from Amazon in various shades of pink, grey and black. It was a fun project! My husband spray painted the big arrow (from Target). Thankfully, we didn’t have to replace a lot of the furniture in the room. 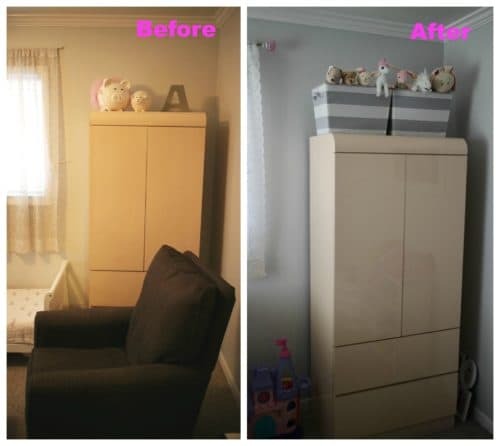 I was able to move two pink wardrobes and a bookcase to other areas to maximize space and storage for our growing Boca girl. 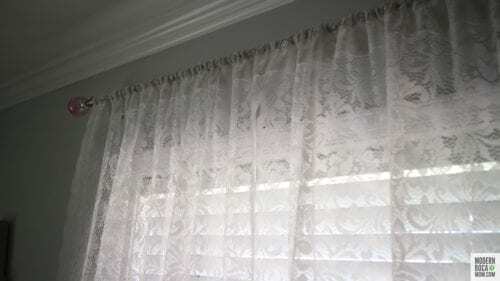 We upgraded the curtain rods to a sturdier model from Bed Bath and Beyond after baby/toddler Avery yanked on them too many times to count. She loved choosing the finials– glass balls in pink of course! 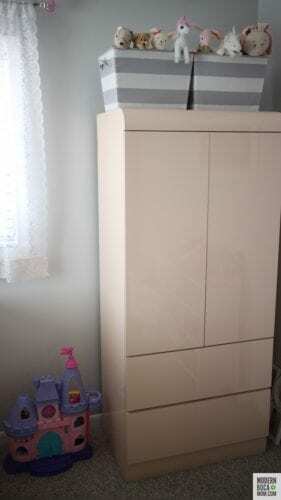 We also designed a system for her school clothes utilizing colored drawers for each day of the week. It was so easy! 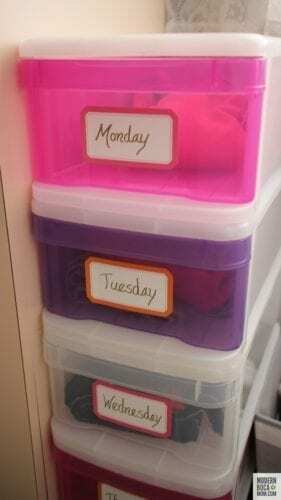 I purchased 5 stackable shoe box drawers from the Container Store (in pink and purple of course). Then, I labeled each one with a day of the week in gold, metallic pen. 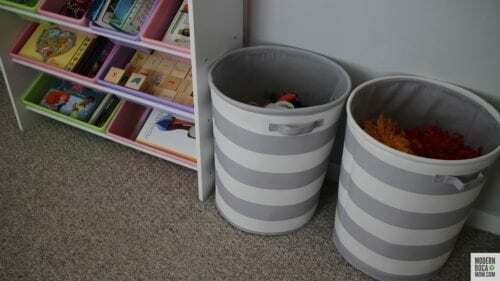 Every Sunday, our daughter is now in charge of putting a school uniform, underwear and socks into each drawer. Getting dressed in the morning has become much less of a struggle! I also invested in storage floor totes from Target for toys and dolls and matching bins for our massive collection of stuffed animals. I am very happy with the way the room turned out, but more importantly, #dailybocaavery loves it! The key to getting 12 hours of sleep out of our child each night was a bigger bed, apparently. This post contains affiliate links. If you click and purchase some of these items, I may be compensated. Please see this site’s Disclosure for details.